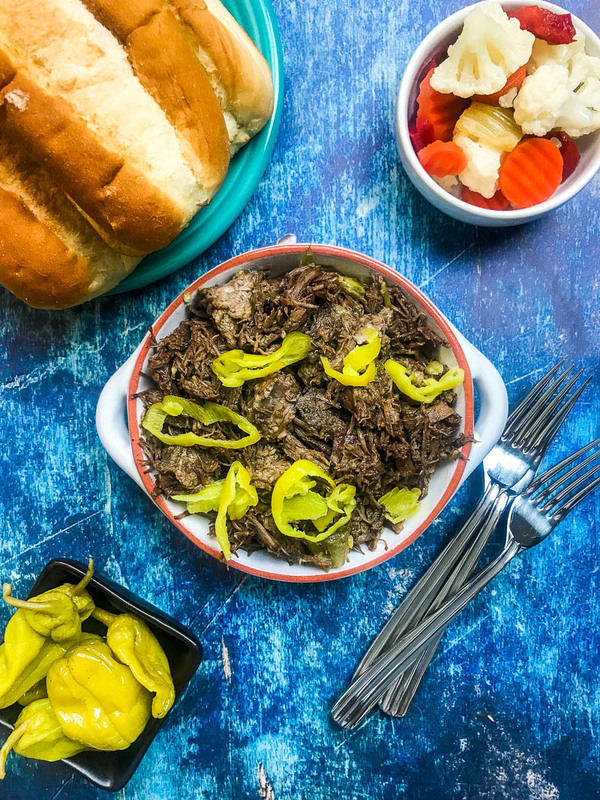 Italian beef is the perfect party food for a large crowd. 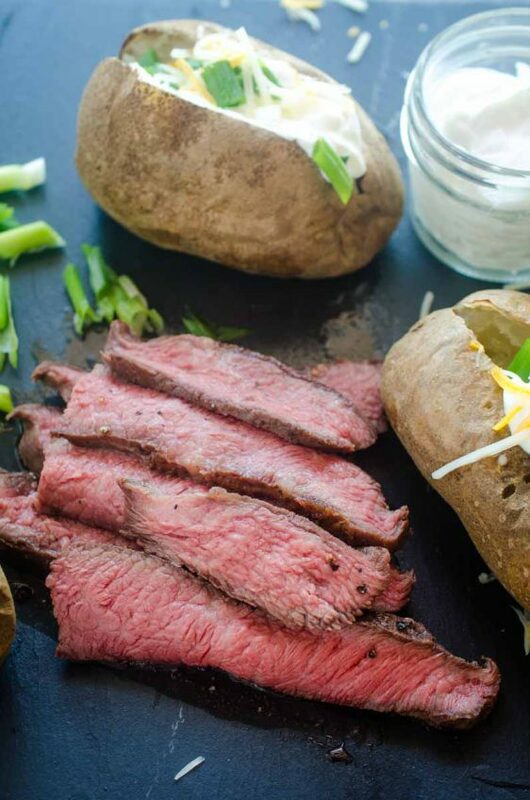 This easy slow cooker recipe is the food that game day fans crave! 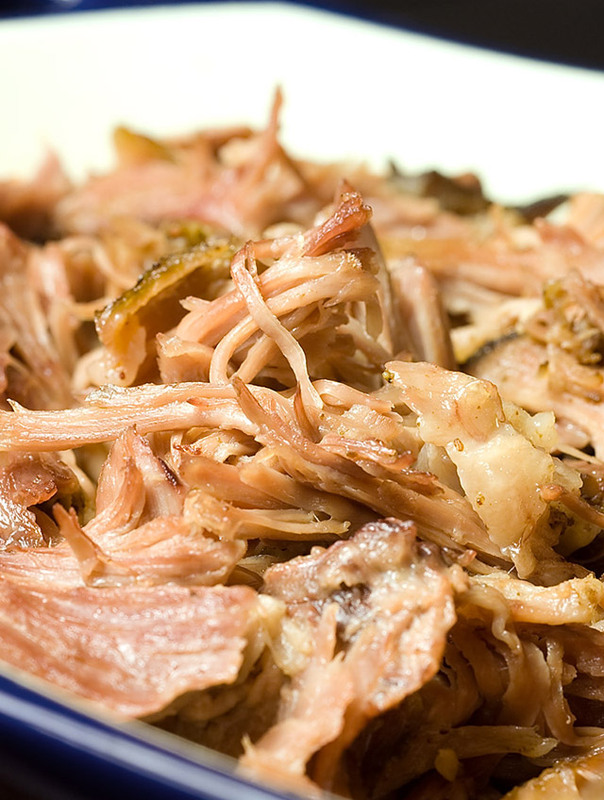 We make a lot of Slow Cooker Pulled Pork around here. Which means that we eat lots of pulled pork sandwiches. Why I never thought to give Italian Beef a try until now is beyond me. And you can even make this version in the slow cooker OR the Instant Pot. How do you make Italian Beef? 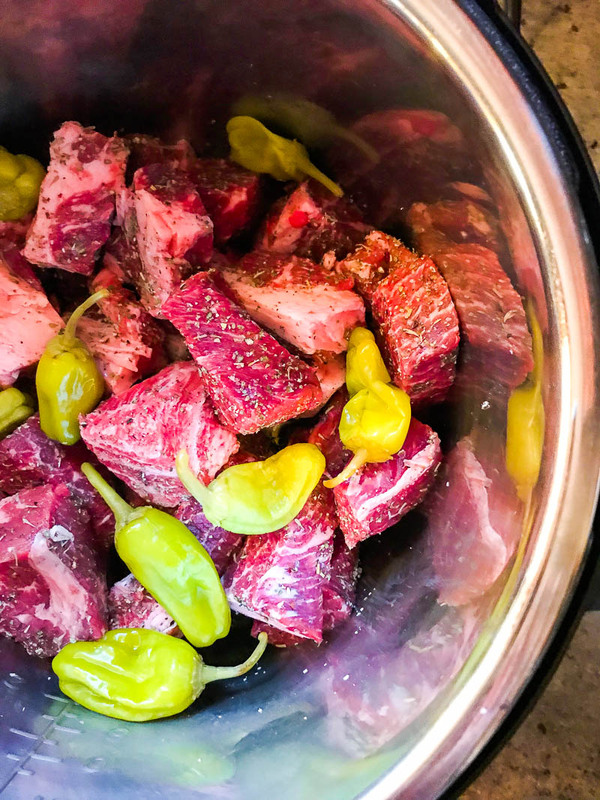 To make Italian beef, you’re going to want to use a chuck roast. The same roast that you’d use if you were making a pot roast. Then you’ll want to season the roast generously with salt, pepper and Italian seasoning. When it comes to cooking it, you have two options. You can cook it in the slow cooker or you can cook it in the pressure cooker. If you pick the slow cooker, place the seasoned beef in your slow cooker, scatter some pepperoncini over top, pour in some beef broth and juice from the pepperoncini and cook for 5 /1 hours. 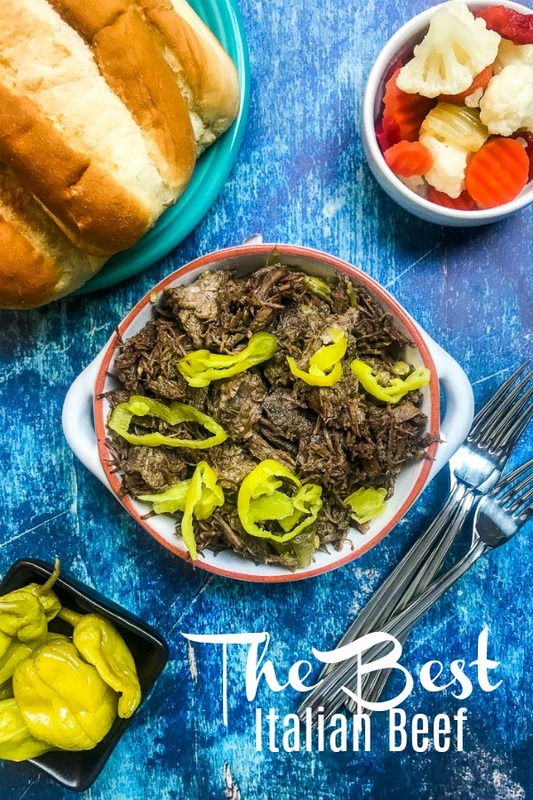 If you want to make Instant Pot Italian Beef, you will place all of the ingredients in the instant pot, seal it and cook for 90 minutes. 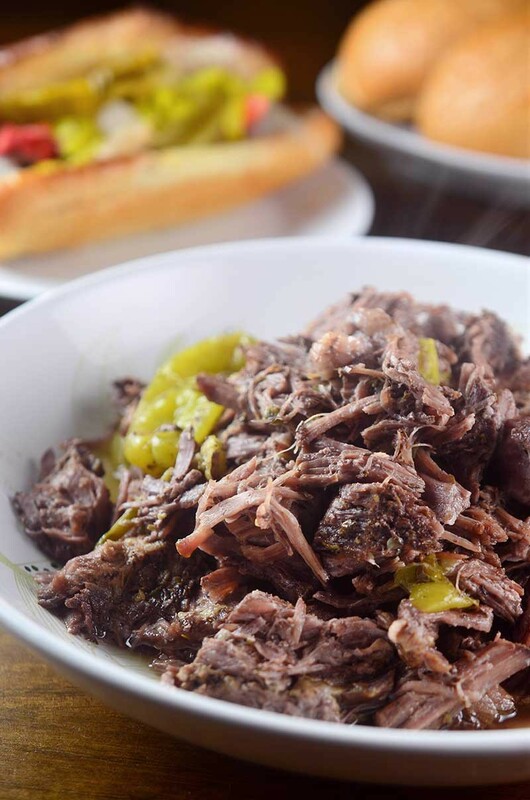 Both cooking methods will get you tender, melt in your mouth Italian Beef. What do you make with Italian beef? More Words: Totally loaded and delectable Italian Beef Sandwiches. I just love all of the goodies piled on these things. For the toppings, I chose thick cut smoked provolone (Tillamook only friends, trust me), pepperoncini and giardiniera, spicy if you can find it. The added heat is perfection. If you want to make your own pepperonicini you can too! Finally, with all the goodies, I highly recommend toasting the bread under the broiler before you assemble the sandwich. And once more, after you add the cheese. Note: Originally Published 2016. Updated photos and Instant Pot instructions 2019. Combine salt, pepper and Italian seasoning together in a bowl. Place roast in the slow cooker. Sprinkle seasoning over the beef and toss to coat. Add in whole pepperoncini. Pour in juice from peppers and beef broth. Cover and cook on high for 5 1/2 hours. After cooking, use a slotted spoon to remove the beef from the slow cooker. Shred. Toast hoagie rolls under broiler. To assemble a sandwich: spoon a generous portion of beef onto one half of hoagie roll and top with provolone. Place back under broiler for 1 minute or until cheese melts. Top with pepperoncini, giardiniera and spicy pickles. Spread mayo on the other half of the hoagie roll. Serve immediately. I was first introduced to the, Italian beef sandwich at a CHURCH members HOT DOG POPUP, THE meat was so tender that i couldn’t believe it was Chuck roast, AND THE pepper was so good I had never even seen PEPPERS LIKE THAT BEFORE TINY LITTLE SPICY WITH A HINT OF SWEETNESS AND THE BEER BROTH WAS AMAZING. 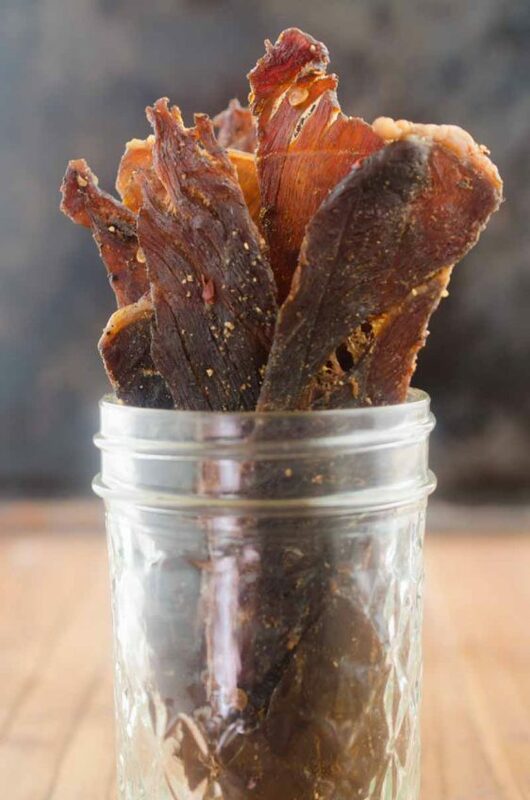 SO I AM GLAD TO SEE THIS RECIPE, A FRIEND OF MINE DAUGHTER WENT TO CHICAGO AND BROUGHT A BIG JAR OF THE PEPPERS SO I ASK FOR SOME ,SO I WILL BE MAKING THIS SANDWICH SOON. This would be a great meal prep recipe! Love it! Looks like a fabulous meal! My family will definitely love this, need to make this soon! Oh this looks extra yummy! 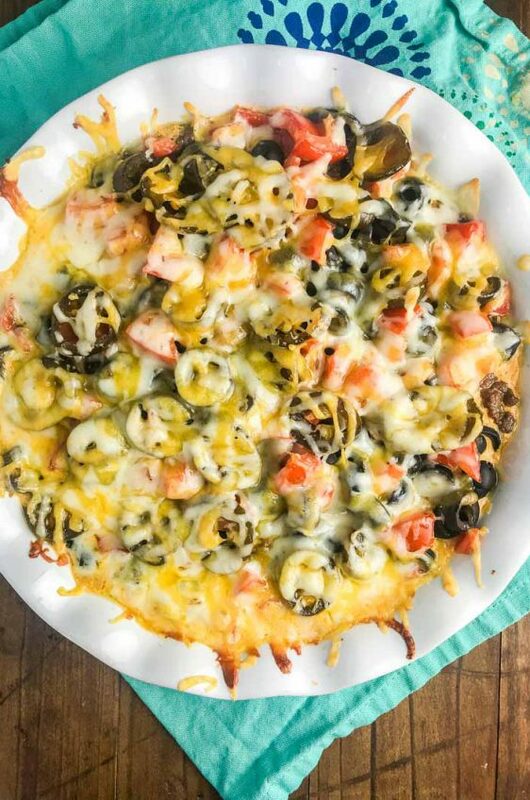 My husband absolutely loves this meal he can’t get enough ! Love these sandwiches and the fact that I could put it in instant pot and forget about it is a bonus. 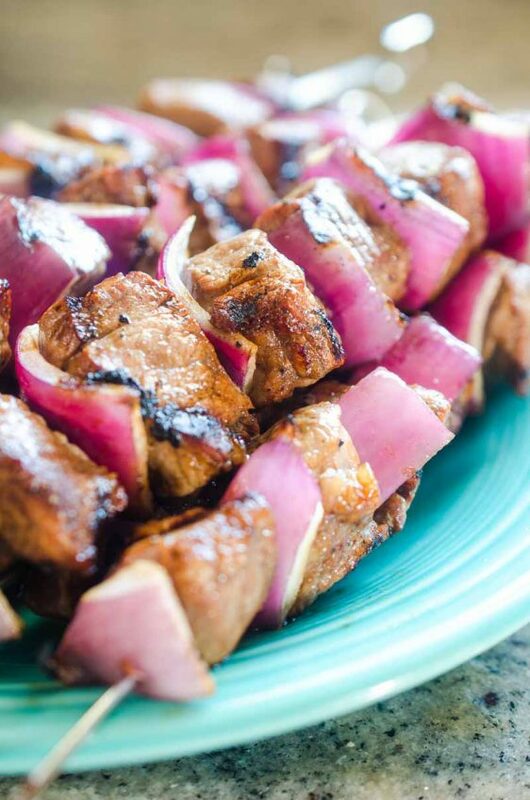 We’ve made this recipe many times — it is easy and delicious. The giardiniera is a great topping on it especially if you like spicy. And provolone? You can never go wrong with that!! I have never had Italian beef, but that’s going to have to change! This sounds delicious. I’ve never tried these before. Seems like the perfect dish to serve to a crowd. Comfort foods with a pop of flavors. Thanks for sharing. I could eat these Italian beef sandwiches any time of the day, all day! 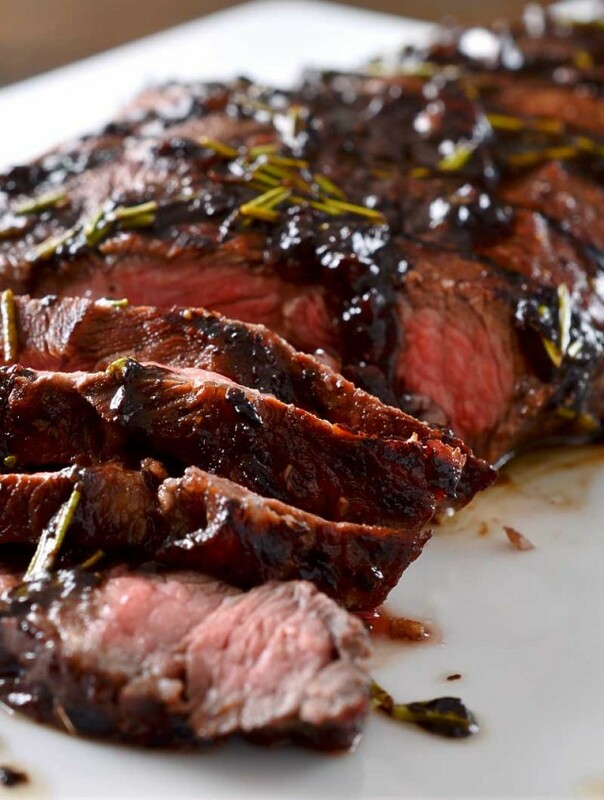 The beef looks so moist and tender. It looks very tender and surely tasty with the right amount of spice. Great in the sandwiches. The beef looks so moist and tender. These beef sandwiches would be heavenly, I’m sure! Yes, I drooled when I saw how moist and delicious the beef came out! I love that you cooked it in a slow cooker as I love to use mine! And the sandwiches look divine and delicious! I have actually tried a recipe that was similar to this and I loved it! I loved the favor of the peppers. It was awesome! That melted cheese with the slow cooker beef…. Heaven! This is pretty much how I make Italian shredded beef in the slow cooker! :) It is one of my husband’s favorites… and mine too. So good! That slow cooker beef is on point! It looks so delicious! 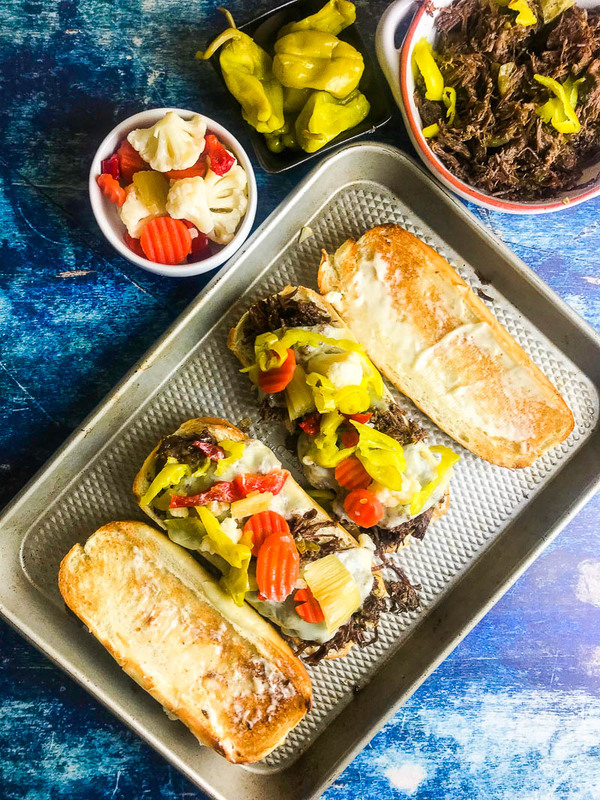 I love Italian Beef Sandwiches and now it looks like I need to make them! Great idea using the slow cooker! So easy and delicious! Oh these sandwiches look so juicy and are calling my name! I love how simple these are!